The bomb attack on Cairo's St. Peter and St. Paul Church on Sunday was carried out by a 22-year-old suicide bomber, President Abdel-Fattah El-Sisi said during an address at a state funeral for the 24 victims of the blast. El-Sisi named the man as Mahmoud Shafiq Mohamed Mostafa. "Since yesterday the police have been gathering the scattered remains of Mahmoud Shafiq Mohamed Mostafa," Sisi said, adding that four people have been arrested, including one woman, for alleged involvement in the incident, while two more suspects are being pursued. 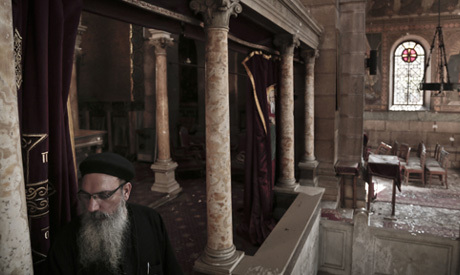 Twenty-four people were killed and 49 injured after a bomb exploded inside a church attached to the Coptic cathedral in Cairo on Sunday, one of the deadliest attacks on Egyptian Christians in recent years. "We will not forfeit our revenge, even after those are arrested, and frankly, the government and the parliament have to act more," El-Sisi said, calling on the executive and legislative authorities to enact laws to enable the judiciary to counter terrorism. "The laws are restricting the judiciary; the judiciary will not be able to deal with terrorism firmly, [to deal with all those who] attack our nation's security and our loved ones," the president said. Before the funeral President El-Sisi held a meeting with Prime Minister Sherif Ismail and a number of other senior security officials to follow up on the investigations of the deadly attack and security measures in place around the country, an earlier presidential statement said. The meeting was attended by Defence Minister Sedky Sobhy, Interior Minister Magdy Abdel-Ghafar, and representatives of the National Security Apparatus. El-Sisi said that this attack is an act of despair. “Do not say it was a security flaw; what happened was an act of desperation," he said. "They [evil forces] have been trying to shake us for three years; they [try to ruin the] economy but nothing, terrorism and nothing…75 attacks on churches but still nothing." "Our condolences to all the Egyptian people, I will not say our Christian brothers, our condolences to all Egyptians," the president said. "This attack caused a great pain but it will never break us…We will stand firm and God willing we will win this war," El-Sisi concluded his address. Sunday’s attack, which blasted through the side inside the church where women worshippers sit, is considered the biggest such attack on a Coptic church since January 2011, when 23 people were killed in an explosion at Two Saints Church in Alexandria. The perpetrators of the Alexandria attack were never discovered. On Sunday, Egypt’s official news agency MENA quoted a security source as saying that the explosion was caused by a bomb containing 12kg of TNT. No group has yet claimed responsibility for Sunday’s attack.